Thank you friends, designer makers,shoppers and crafters for making this year such a great one! Lets make 2009 a hand made one!!! This is our second review and we hope that it's just bad luck that we've come across two craft markets that were if nothing else a great place to meet other designer makers but not so great overall! "The Angel art and craft market happens on a weekly basis in Angel near the old Punk/ Goth haunt the Slime Light.The idea of Candid Arts holding a Christmas craft market filled us with excitement as this well established art charity has plenty of Kudos and patrons. Tucked behind the tube station in a very wide alley Candid Arts sits proudly but almost invisible. With it's large industrial doors you could be forgiven for thinking that it wasn't actually there! There's a small sandwich board just outside the door but you'd hardly see it from the main road. As you go through the large courtyard garden, nestled amidst office blocks and old brick faced factories small clusters of mismatched tables and chairs clumsily sit on old characterful paved floors. The place itself is gorgeous and has so much potential! The stall prices are overly expensive and for that kind of money (£120 for two days and a preview night) you'd expect their publicity machine to be working overtime! We waited over an hour for a table and were greeted with three dirty cafe tables. Others had to place their products on the floor as it wasn't made clear that it was a B.Y.O. table event. The publicity was almost nonexistent. The flyers and banners were in such drab colours that you could hardly see them. On the high street there were no posters or at least a sandwich board would have been nice. This was left near the door next to the saddest Christmas tree I have ever seen. Inside the variety of craft was unfortunate, mainly jewellery and a few others like two ceramists,painters,felt makers and someone selling African artifacts that were clearly bought in Morocco at a wholesaler. As they have a very strict pre vetting system I find this really amazing and shocking! The Candid Arts cafe is cute and you have to go through the courtyard and up some metal stairs to get there. The staff were young,inexperienced and clueless but as we were there we thought we could support them by bringing them our custom. A small sandwich no bigger then 20cm of baguette and a slice of cheese and a few salad leaves was more expensive then in a high street coffee shop chain. For over £3.00 you expect a decent filling in a sandwich! I won't mention the coffee. The flyer promised mulled wine,carols and minced pies.It seemed to me that this was complimentary so to get people through the doors and shopping. There was no mention of any charge. The sour faced bar staff asked for £2.00 without conveying that it was a donation based option.It was up to me weather to give them £2 or not but I was made to feel like there was no choice and if I didn't like it I could go else where. Minced pies and carols were no where to be found. The loos were dirty and overflowed. The heating was most of the time switched off and when a stall holder went to turn the calor gas heater on he was reprimanded by one of the staff. Over all it was held in a beautiful venue though the staff and organizers were unhelpful, aloof, dippy and very slow. Hardly any shopper came through the doors and I have to say that I won't be giving my hard earned cash to people that are only filling a quota.Be it a charity or not! I get it that it's a charity but even so and because of that you'd expect something quite great or at least minimally organised! I got the feeling that as long as they were making their money then the stall holders,their welfare and all the rest didn't matter! Unfortunate but I hope they get their act together." This review was submitted by an genuine designer maker that partook in the above event. These are personal opinions and are subjected to individual views and expectations. If you have been mentioned in this post and feel misrepresented please contact us and we'll post your side of the story. 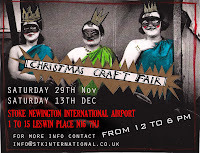 One of our lovely friends took up a stall at this new up and coming craft fair in Stoke Newington.They go by the name of STOKE NEWINGTON INTERNATIONAL AIRPORT. We'll be reviewing old and new weekly/monthly craft fairs so you the designer makers know exactly what you get and you the event organiser gets a feel of what is working and what isn't from the designers point of view! As part of our service to our members we thought that a review was in order and so asked L.S. to be our first Lois Lane. We hope you find it informative. It's not our intention to point the finger or pass judgment. We hope that by shinning a light on the negatives as well as the positive aspects that the organisers/people responsible take in account the opinions of the designer makers and take positive action. "To start there were only 9/10 stalls (not enough to make a fair proper) and to be honest no room for anymore as the bulk of the space was set up for the cafe area with loads of sofa's etc... Which incidentally was very expensive, £1.20 for a tea... Nearly £2 for a coffee... and £2 for a small slice of cake...I don't expect to pay Costa coffee prices in a back street gallery space! When I quizzed one of the guys about how they had advertised the event, I was told they'd sent it out to their mailing list and to their friends on facebook, I'm a friend and I didn't receive anything! I did find an event on there, which had been set up by one of the stall holder... not the organisers! I should have known when I saw 12 stalls advertised on the invite... I had hoped it was a typing error!" "The guys running the show were pleasant amiable people, but alas with little or no organisational skills when it comes to craft fairs..."
We don't want to be harsh but you need to get the designer makers onside if you plan to make these craft fairs an ongoing event! The venue looks promising with a shabby chic feel to it and honestly I think that with the right sort of publicity, marketing and management it could be quite a big player in the art and music scene in years to come. As part of our ethos we encourage our craft guerrilla boys and girls to take up stalls with other organizations and craft groups.It's all about taking opportunities and making it work for each individual! We have been asked to post information up on our blog about up and coming craft markets and we're happy to do so. Because of the huge numbers we receive we thought we'd review these markets so people can make an informed choice weather to take up a stall ...or not as the case may be. I hope that the reviews will prove helpful and remain factual as we do not want to hurt any one's feeling but we will let you know if it's good or a complete waste of time! As we very well know no matter how well you publicize,organize etc. if shoppers do not come then that's just the nature of the beast! There are many factors that have to be taken into account like weather,economy etc. Craft markets are very unpredictable and the fact that they are busy people wise doesn't mean that the designer makers are making any money... but what is essentially is that the organizers are helpful, sincere and that their events are not about just making money (even filling quotas in some cases) or to cover their costs or line their pockets. Stay tuned as the first review will come soon! One of the interesting yet sad facts about Walthamstow is that it's the only London borough with out a cinema. OH well that's just another thing that we've had to grow accustomed to but we're still hopeful that one day we will have a cinema and fingers crossed it won't be a multiplex! The former Coronet is a gorgeous cinema decorated in absolute Art Deco splendour but it's crumbling away...left to rot like all the great things in this culturally starved part of town! BUT there is a little light that shines and both the Mc Guffin Society and the Hornbeam Centre against all odds manage to screen a few gems in their make shift cinemas. Of the youth orchestras Sir Simon Rattle, principal conductor of the Berlin Philharmonic, has said “There is no more important work being done in music than what is being done in Venezuela ". An extraordinary music project in Venezuela is transforming the lives of the nation’s poorest children using music to tackle the social problems of a country where 60% of the population live below the poverty line. By offering free instruments and tuition to 275,000 children through a network of after-school centres all over the country, the Venezuelan Youth Orchestra System has kept thousands of children away from the drugs, alcohol and gang-related violence of the streets. This orchestra system has produced some of the most renowned musicians in the world. But most importantly, it has tackled social exclusion whilst exposing children of all ages, races, and social classes to the wonders of music for ever changing their relationship with arts and their communities. "We Make" in Tottenham Crt. Rd . Euston or "BUST"! Don't forget that this Saturday the lovely people of BUST and "We Make London" will be holding their Christmas offerings! A few of the Craft Guerrilla gang will be their selling their wares so into town we go! MAKE YOUR CHRISTMAS A HAND MADE ONE!!! "HMMMMMM my little crafty one I think you are onto something!" I reply with a large smile,a cocktail in one hand and a cup cake in another! Like many of the Craft Guerrillas I love to branch out into all sorts of creative endeavors. I suppose that's the danger of entering the world of craft when you are an overactive creative creature. I have a few alter egos: Handsome Betty is a baker and Munano is a naughty little spark of imagination that inhabits a world of Kawaii and Japanese delights! I noticed that there were others like me...not content with sticking to the one craft they spend all their spare time plunging into other creative offerings. So why not make a book showcasing simple projects and recipes? Can we send something out into the world that will hopefully inspire and bring people together? Heck yes!!! So here's where the work begins and to do this we will need your help! We want two things...1) an original craft project of easy execution and 2)a favourite recipe (be it cake or cocktail!). Then if selected we will send you a questionnaire and get all your info/bio details from you. Also we're hoping to wrangle an illustrator or two to do the main background image work of the book so if you're interested let me know and we'll start working on it!